Animals Everywhere! by Simon Abbott. Review: Have you ever wondered, how many animals there are and what they can do? In Animals Everywhere! by Simon Abbott, readers can learn about every animal they can imagine. If you want to know about a harp seal, or a polar bear it's there. This book is filled with all sorts of interesting facts about animals, habitats, and more! In Animals Everywhere, you can learn about exciting facts about unusual animals, and what habitat they live in. For example, in the book you find out that, "Toucans have bills that can be longer than a banana!" You also learn that, "an ostrich egg is about as big as 24 hen's eggs." These are just two interesting facts from the book! If you want more facts like that, you'll just have to read Animals Everywhere! Animals Everywhere! is a fantastic book about animals. I personally enjoyed it because it had a lot of amazing facts about animals. My favorite fact was that a gray wolf's howl could be heard up to 6 miles away. I also really liked the way the author organized the book. First of all, the author put the name of the habitat at the top of the page and had all the animals that lived there on that page. Animals Everywhere! is filled with a vast amount of wonderful pictures that kids would love! The pictures are drawn in a way that children would understand. Overall, the book has a great purpose to it, which is to inform and entertain kids about animals in a fun way that will make kids want to read more! 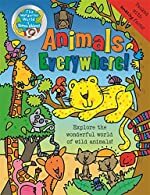 We would like to thank Ticktock Publishing for providing a copy of Animals Everywhere! for this review. Have you read Animals Everywhere!? How would you rate it?